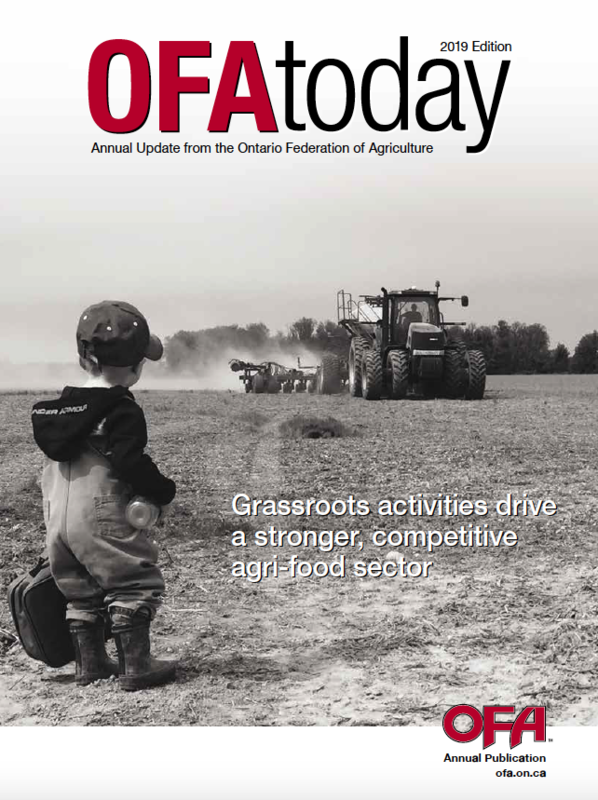 The Ontario Federation of Agriculture (OFA) has published its 2019 edition of OFA Today magazine featuring the winning entry of OFA’s Proud to Farm photo contest on the cover. The annual publication, which hit OFA member mailboxes this week, is a valuable resource for communicating with our members on key issues and activities affecting their farm businesses. Inside this year’s edition, we reflect on another busy and productive year for the organization. We share highlights from OFA projects, initiatives and activities, OFA member contest winners, key priorities impacting Ontario farm families, and bid farewell to retiring OFA staff and board members. We also feature a recap of OFA’s advocacy and government relations activities, 2018 membership survey, Member Service Representative (MSR) profiles, agricultural policy work and updates on our Benefit Program that delivers enhanced value and savings to all OFA members. OFA Today is distributed to all OFA members with their February issue of Better Farming magazine. If you did not receive your copy of the magazine, please contact Member Relations at 1-800-668-3276.